Imagine it is the middle of the 1800s and you have been invited as a guest to an exclusive manor house dinner party. Agasp is heard from across the room. A wealthy business owner’s wife steps timidly and gracefully down the stairs, yet even from a distance, everyone can see the distinct, bewitching glimmer of the ring on her gloved finger. As she emerges into the candlelit room, the bright fire of the diamond is spoken about in whispers. This is the mystique and allure of the mine cut diamond. Worn mostly by nobility and other members of dominant society during the 18th and 19th centuries, mine cut diamonds were hailed as both a symbol of wealth and the exotic. Traveling thousands of miles from mines in India and later in Brazil (after new diamond deposits were discovered there in 1726), these precious stones were treasured among the competing elite for their exquisite beauty, rarity, and charm. Brazilian mine cut stones were initially not thought to be of the same quality as Indian mine cut diamonds. Therefore, to optimize pricing and bartering, Portuguese traders traveled through Goa, a well-known Indian diamond trade port and then back through Europe to sell them as genuine, highly-prized Golconda diamonds despite their original sourcing. Many of these Brazilian mines cut diamonds were found in the Mato Grosso region and in other rivers across Minas Gerais. It has been historically noted that the Jequitinhonha River provided large quantities of diamonds for Portuguese gem seekers. Those original rough diamond stones were found in small cracks and traps in the bedrock of those rivers. With a wealth of riches pouring forth from Brazilian sourcing and mining, the seas of change were stirring for the trade of mine cut diamonds. Indian diamond mining was steadily declining due to an exhaustion of their natural mineral deposits, thus Portuguese and consequently Brazilian competition increased rapidly. The mystique of the unknown regarding mining operations in distant lands mesmerized diamond seekers. The impressive tales of the fortress city of Golconda and the bewitching mystery of Goa captivated the public and seduced buyers into seeking these precious gems. Seeing as bruting machines that cut stones mechanically were not invented until the 1900s, people were spellbound by the notion that each individual stone was carefully held and uniquely crafted during a specific time, in one particular place, under abstract light, and that no two mine-cut diamonds were ever exactly the same. 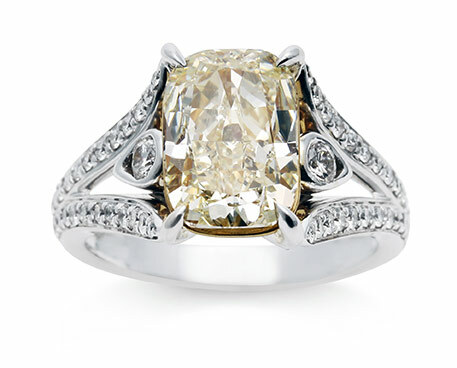 One may then ask: What are the specific features of a mine cut diamond that cause this “fire” the stone is known for? Unlike the majority of diamonds on the market today, mine cut diamonds are each one of a kind. Diamond cutters of old inventively assessed each stone and carefully-cut and shaped each piece in the low light of dark mines. Although not every stone was cut in dim light, this is essentially how this diamond cut came to bear its specific name. Diamond miners and artisans were seeking “high-color” stones that still shone and glittered in low light. This is one of the main reasons why most mines cut diamonds are not typically graded well on a scale used for contemporary standards of brilliant white color, carat, cut, or clarity. At the time, miners would have been looking for distinct stones that shone in different light filters. This process allowed for each individually mine cut diamond to express a unique color and flash that boosted the diamond’s “fire” in candlelit and lowlight settings. Some have also asked, “But aren’t mine cut and European cut diamonds the same?” The answer is no. 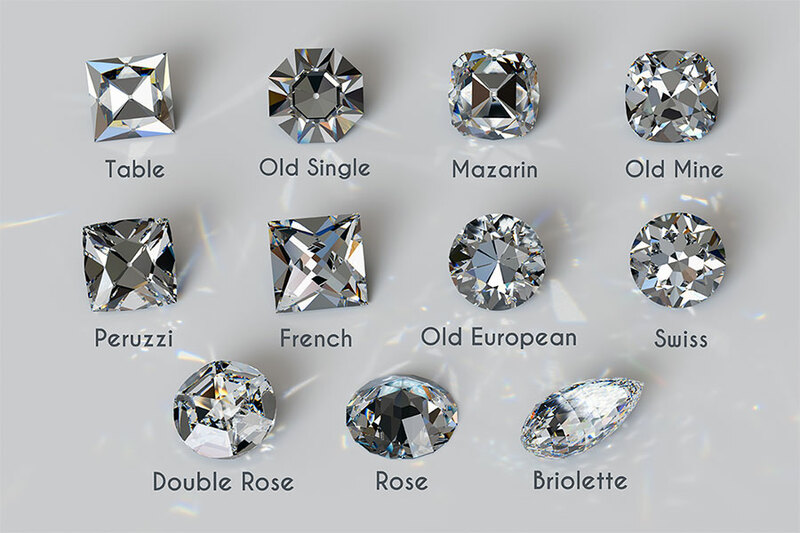 Old European diamond cut stones, although markedly similar to old mine cut gems, bear different characteristics than their older cousins. Here is a general way to tell the difference between the two. Mine cut diamonds are generally squarer in shape, and closer to that of a cushion cut or “pillow” structure. Also, and perhaps one of the most distinctive features is that of the culet or the very tip at the bottom of the diamond. On mine cut gems, the culet is actually “cut off” at the bottom instead of coming to a point. Creating a window into the gem, the flatter culet allows light to stream through the gemstone. This enables the gazer to appreciate and actually see all parts of the stone itself, including its charming imperfections. In contrast, old European cuts are rounder in shape with a smaller table. The table of the diamond is the top-most portion of the stone. Also, as diamond cutting became more sophisticated, stone cutters starting shaping more uniformly with a greater eye for symmetry, hence the rounder shape. In summary, both stones have high crowns, smaller tables, unpolished and generally thick girdles, tall and steep pavilions, and flat culets. Also, there are fifty-eight facets that grant that “larger than life” appearance in both old mine cut and old European cut stones. Therefore, it is not uncommon for untrained jewelers or buyers to mistakenly swap mine cut diamonds for old European cuts or the other way around. This is why it is important to trust a reputable jeweler if you own one of these stones to tell the difference. With that in mind, it is also not uncommon for untrained jewelers or buyers to use strict modern standards to appraise old mine cut diamonds inappropriately. 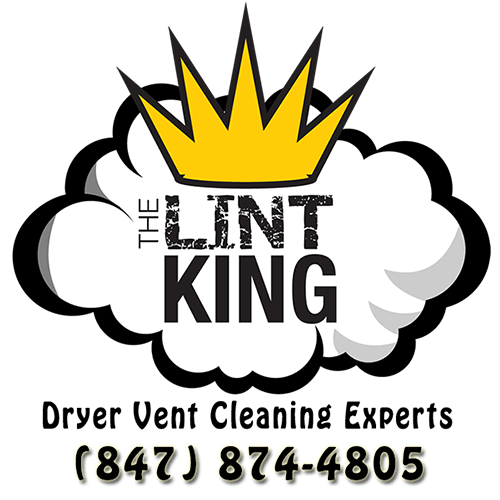 Seeing as mine cuts are known for their irregularities in color and authentic imperfections, a standard current grading would not be suitable when determining the value of the stone itself. It takes a seasoned jeweler with experience to note the inherent characteristics and promise of the ever-charming mine cut diamond. It is also important to consider that no new mine cuts will ever be mined “authentically” again. This means that they are antique relics intended to be appreciated and evaluated on those terms as well. Conclusively, when it comes to selling your jewelry, you should always trust a professional in person with the expertise and experience to assess its worth correctly. 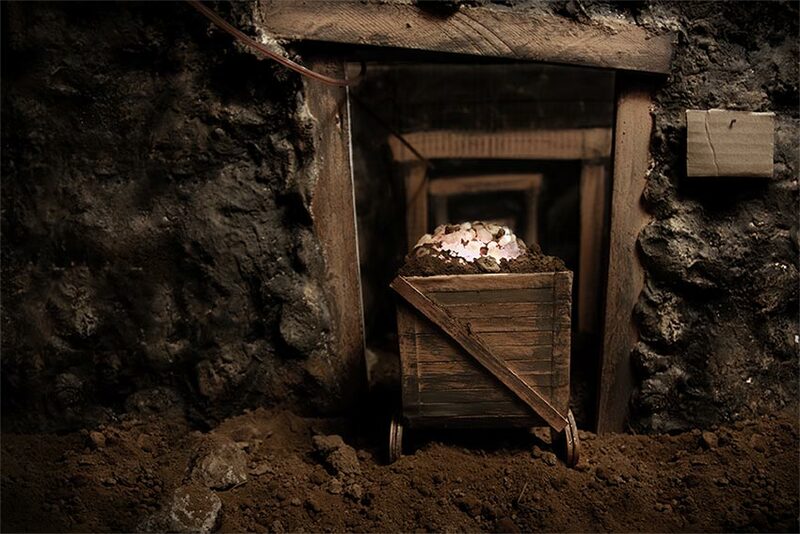 If you have an old mine cut diamond, know that you have a treasure valued the world over for its character, glittering “fire,” and European aura. 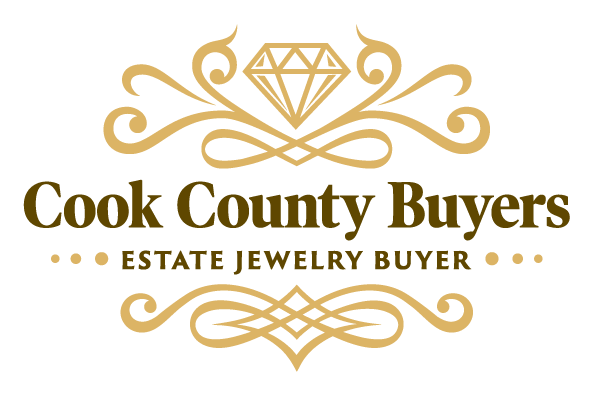 If you are seeking one for yourself, trust a professional jeweler as your guide. These sought-after gemstones are indeed rarer than most, but like any prize worth exploring, they can be found.